Posted to RAF Leuchars for demob in Dec1969. Do I qualify for a MAMS badge as I participated in this line flying with the aircraft to various places? What a great site - sure brings it all back. 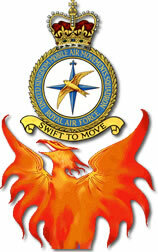 I was on 27 Movements Course RAF Abingdon, finished Dec1966. Can’t wait for to hear from somebody who knows me especially Billy Wright and Chick Hatch from the Portsmouth & Plymouth areas. Chick Hatch was an old friend of mine, will pull out his address and advise. He's in the Staffs area. Chick retired as a WO some 5 or so years ago and was awarded an MBE on his retirement. Anyone who has ever had to organise a function will find this very true. I'm happy to inform you that the company Christmas Party will take place on December 23, starting at noon in the private function room at the Grill House. There w! ill be a cash bar and plenty of drinks! We'll have a small band playing traditional carols...feel free to sing along. And don't be surprised if our CEO shows up dressed as Santa Claus! A Christmas tree will be lit at 1:00pm. Exchange of gifts among employees can be done at that time, however, no gift should be over $10.00 to make the giving of gifts easy for everyone's pockets. This gathering is only for employees! A special announcement will be made by our CEO at that time! British military personnel stationed in the Gulf have been put on heightened alert for possible terrorist attacks as senior American commanders prepare to stage a crucial computerized war games exercise this week in the small Arabian emirate of Qatar. Nearly 400 British officers have arrived in Qatar to join Gen Tommy Franks, the American commander who would direct an invasion of Iraq, and about 600 war planners from his Central Command (Centcom) in Tampa, Florida. Exercise Internal Look, which will test command operations of navy, air force, army and marine forces in the Gulf, is being conducted from a mobile control centre at a US base in scrubby desert on the outskirts of the Qatari capital, Doha. Although the scenario is classified, it is understood to include simulations for a US-led attack on Iraq as well other possible Middle East crises. The decision to maintain Centcom's field headquarters in Qatar after the week-long exercise is completed in mid-December is a strong indication that the sandy, stone-strewn peninsula will be the nerve centre for an American operation to overthrow Saddam Hussein. The biennial command exercise was first held in 1990, but this is the first time it has been staged outside the US. The timing - it starts tomorrow as Washington begins analysing Saddam's declaration to the United Nations on his weapons programme - also sends a clear message to Baghdad. In Bahrain, home of the US 5th Fleet and a US Marine force, RAF and Royal Navy personnel have been advised to avoid bars, nightclubs and other areas popular with their American counterparts. These are considered prime targets for a possible terror strike by al-Qa'eda or other Arab militants opposed to plans to attack Iraq. They have also been told not to wear any military-related clothing off-base and to say that they are "on holiday" if asked why they are in Bahrain. Fears of a terrorist incident in the Gulf have increased following the recent attacks on so-called "soft targets" in Bali and Mombassa. The Gulf states have substantial Western expatriate communities while Dubai and Bahrain are increasingly popular winter holiday destinations and air traffic hubs. This weekend was seen as particularly high-risk as Arabs from neighbouring states have been flocking to Bahrain and the United Arab Emirates - where alcohol is more freely available - for the Eid celebrations marking the end of the holy month of Ramadan. Although there have been no specific threats against British interests, the Foreign Office last month urged Britons in the Gulf to be particularly vigilant in places frequented by foreigners. The preponderance of Gulf Arabs within al-Qaeda's hierarchy further fuelled concerns. American flags were burned in Bahrain in protests nine days ago and there have been several attacks on US forces in Kuwait. Qatar, host of the Internal Look exercise, is one of the region's most stable states. It is ruled by the staunchly pro-US and Sandhurst-educated Sheikh Hamad bin Khalifa al-Thani, a strong believer in the American security umbrella as protection in what is a volatile region. The emirate, where only 150,000 of the 700,000 residents are Qataris and which has the world's second largest gas reserves, looks nervously at Iran and Iraq and has lost confidence in Saudi Arabia's ability to maintain stability in the Gulf after the invasion of Kuwait. So enthusiastic was Sheikh Hamad to attract an American military presence that he spent more than £600 million building the Al Udeid airbase in the desert 20 miles from Doha to encourage them. The US has already stationed dozens of aircraft and a 3,200-force there to lessen its dependence on the Prince Sultan air command base in Saudi Arabia. As Washington's relations with Riyadh have deteriorated since the September 11 attacks, Qatar has taken on increasing significance in American military planning. Gen Franks, who ran the Afghan war from Florida, landed on Friday on Al Udeid's 15,000ft runway, the longest in the Gulf. He will head Exercise Internal Look from another base, As Sayliyah, where the Americans have been stockpiling tanks and other equipment before shipping them on to forward positions located in Kuwait. A team of about 1,000 US and British military specialists will use a sophisticated mobile electronic command post, recently shipped to Doha from Florida, to link US and allied forces throughout the region with each other and with Centcom headquarters in the computer simulation. No troops will participate. As well as the 375 British officers now in Qatar - mainly from the Permanent Joint Headquarters (PJHQ) at Northwood in London - another 400 will take part in the exercise from bases in Britain, the US and the Gulf. Subject: Want to be a PILOT? Yet another tale of my experiences as a corporal airframe fitter at No 60 MU RAF Church Fenton and later Dishforth. Of course the role of the Avro Shackleton was maritime surveillance - plodding a grid pattern over the World’s oceans and seas. So, here I was, an aspiring RAF pilot and this was the first inkling that flying - was not/is not - that rosy! Ozzy, for those of you who know him, is a hard working trooper who has given his all to the RAF since he was 17 years old. He’s now 40 and he has been on long term sick for the past 2 years for a back injury, which is the result of one too many VC10 vents and belly holds. The RAF is unceremoniously releasing our Ozzy as of January 2003, where he goes onto a pension of £10,000 a year. He is getting no compensation for his injury and he suffers great pain, which has been aggravated by RAF medical specialists and our former football star has to sue the RAF to get what you would think he should have been given without all this fuss. Twenty plus years service obviously doesn’t count for too much eh? How many of us have injuries as a result of years of working with poor or non-existent equipment, and ACHE that dies the moment it hits a foreign pan? The RAF gets by on the sacrifices of 20 year old working class lads who ‘get stuck in’ shouting “two-six” as they permanently damage their bodies as a matter of routine. We can hack it, when we were 20, but when we are 40 years old and knackered the RAF has no time for us and scours the council estates of the UK looking for fresh blood to throw once more into the breech. Nothing changes, I see the article about the Afghanistan deployment eludes to the fact that both Henley’s were U/S as soon as they got there, so the troops will have ‘cracked on’ and stripped pallets down on the ramp and man-handled the load plus the 400lb pallets. Then they struggled with role changes because of the usual piss-poor planning. But Ozzy gets a nice medical discharge with half a pension. Thank goodness I now work for an organization that values it's staff and compensates fully any of us who get injured on the job, and in Police work we get lots of injuries! Those of you still in the RAF, look after that body of yours, don’t be like the guys [in the vicinity of] Christmas Island in 1952, watching nuclear explosions protected from the radiation with sunglasses, only to die from leukemia a few years later. I’m sure their bosses told them that they could hack it too. Remember that the MOD will give you the very least it can get away with and in turn don’t put yourself in harm’s way, or you will regret it 20 years down the road. I bet none of the doctors who saw Ozzy or the flunkies at the MOD have ever done a Belize ‘flat floor’ or a QTR on a VC10 in the snow at Goose Bay. Or any other of the myriad of character building stuff we did and others do as a matter of their work day or night. Those good doctors and bureaucrats will have been at home with their families once they signed the papers denying MOD responsibility for his injury. Regarding the note I received from a member of Alcoholics Anonymous requesting a non-drinking table ... you didn't sign your name. I'm happy to accommodate this request, but if I put a sign on a table that reads, "AA Only"; you wouldn't be anonymous anymore. How am I supposed to handle this? Somebody? Forget about the gifts exchange, no gifts exchange are allowed since the union members feel that $10.00 is too much money and executives believe $10.00 is a little chintzy. NO GIFTS EXCHANGE WILL BE ALLOWED! I enjoyed Dave Webb's piece on the 1935 stamp. Believe or not Dave there WERE aircraft before my days at Labuan. Had I been there those covers would have been "moved." I don't know about costing an arm and a leg but these days it would probably be worth both arms, both legs and a few dangly bits. I fly across the Tasman Sea shortly to do the “Ho Ho Ho” bit for my grandchildren. Judy joins me in wishing you, and your families, the very best of Christmases and a peaceful New Year. I am sure you will all join me in assuring those still serving that they will be much in our thoughts in 2003. What can I say, since I joined some time ago now your site just gets better and better. Keep up the good work. Best regards from A VERY warm RAF Mt Pleasant...23 degrees Centigrade today. She quickly wrapped a towel around herself and raced down to answer the door. It was Ted from next door. Ted said, "Good morning, I'll give you £800 if you drop that towel". She had a quick think and thought, ‘what the heck.’ Without further ado she dropped her towel and stood there starkers. Ted was thrilled to say the least and he passed her the money. She went upstairs with a smirk on her face and her husband shouted out "Who was that darling?" She replied, "Oh it was only Ted from next door." The husband shouted back, "Did he give you that £800 he owes me?" Although a Supplier (with movements annotation) I thoroughly enjoyed my time on MAMS. The last 18 months of which were as Ian Berry's sidekick on B shift - "Happy Times". Despite a wish to go mobile or even as the OC JAMC at South Cerney, I remained resolutely as a DAMO. Got a new job, was offered redundancy from my last place after 10.5 years when I was contacted by an employment agency I know, with a job offer! What timing! Went for an interview and landed the job as Operations Manager for a children's adventure park near Exeter in Devon! So I ended up being paid to leave my old job! The new job is something totally different for me after 20+ years in logistics. I now get paid to ride the roller coaster!! The redundancy money came in handy as my partner Helen and I decided it was time we bought a house, so we have been busy unpacking in our new place in sunny (well most of the time!) Torquay in Devon. I can't believe how your site has grown, I remember when I first got on-line and decided to search for something obscure to see how good this inter-web-net thingy was and I found your site with 3 names on it! I also seem to remember that my name was the first on the database with a union jack beside it! The protestations start but are all in vain, his mind is made up. So we traipse up the stairs to get the details for what looks to be a “fun” weekend in Scotland. The task is very simple, deadhead out to Cyprus, 2-hour wait and jump on the first of 2 Hercs inbound to Leuchars. Offload both and back home on the second one by Saturday evening. Things are looking up……better let the boss know what we are doing. He tries to bump Foddy off the job but the Opso’s not having any of it, so we depart for Brize with big smiles all over our faces. “Yep, looks like you guys just got a free trip to Cyprus!” said the DAMO. The following morning we return to the terminal, strangely all with headaches. (I'm convinced its something to do with hotel air conditioning!!). The VC10 is on time, our seats are confirmed, so its time to collect 200, a bottle and a crate and pass go. I think the morale of the story is – even the worst looking tasks sometimes turn out to be good! P.S. We never did find out who had to tip the two flat floor loads at Leuchars!!! Anyway, enough from me at the moment, I'll send in an updated profile sometime (& picture!). Wishing you, your family and all movers (active or retired) all the best for Christmas and the New Year. What a diverse group we are! I had no idea that December 20 begins the Muslim holy month of Ramadan, which forbids eating and drinking during daylight hours. There goes the party! Seriously, we can appreciate how a luncheon at this time of year does not accommodate our Muslim employees' beliefs. Perhaps the Grill House can hold off on serving your meal until the end of the party- or else package everything for you to take it home in little foil doggy baggy. Will that work? Meanwhile, I've arranged for members of Weight Watchers to sit farthest from the dessert buffet and pregnant women will get the table closest to the restrooms. Gays are allowed to sit with each other. Lesbians do not have to sit with Gay men, each will have their own table. Yes, there will be flower arrangement for the Gay men's table. To the person asking permission to cross dress, no cross dressing allowed though. We will have booster seats for short people. Low-fat food will be available for those on a diet. We cannot control the salt used in the food we suggest for those people with high blood pressure to taste first. There will be fresh fruits as a dessert for Diabetics, the restaurant cannot supply "No Sugar" desserts. Sorry! Did I miss anything?!?!? Britain may scale back its military contribution to a war in Iraq, particularly if America takes action in the coming weeks, according to senior British sources. Tony Blair has intensified the rhetoric of war in recent days, but Britain has not yet moved any heavy equipment to the Middle East to back up its threat of military action. This is in marked contrast with the United States, which has steadily built up its forces in the Gulf and says it will be ready to go to war in January. Senior Government sources said Mr Blair has been reluctant to order the deployment of forces to the Gulf because "it is politically difficult". The reasons include the "overstretch" in the Army caused by the firemen's strike, the Treasury's reluctance to release the money for a major deployment and the strong opposition in the Labour Party. Well-placed sources said the Government is now considering the option of sending a much smaller force than originally envisaged, perhaps more akin to the British role in Afghanistan than to its contribution in the 1991 Gulf war. "The United States needs us politically, not militarily," a senior British source said. "They can do this by themselves, with a few British troops for the cameras." But any calls to reduce Britain's role will be tempered by the need to be seen to make a substantial contribution if Mr Blair wants to play a major role in shaping the post-Saddam era in Iraq and promoting a new Israeli-Palestinian peace process. British contingency planning in Iraq has envisaged deploying a "light" armoured division of up to 23,000 men. But the Government's delay in deploying troops to the Gulf means it is now virtually impossible for such a force to fight a campaign before February. An early war in January means Britain would only be able to contribute lighter forces - such as the SAS, 16 Air Assault Brigade and the Royal Marines 3 Commando Brigade - numbering at most several thousand troops, as well as combat aircraft and a naval force. Military planners say the optimum time for the campaign will be before April, after which the Iraqi desert heat will make it increasingly difficult for Allied troops to fight with protective suits against chemical, biological or nuclear weapons. The resumption of United Nations weapons inspections in Iraq raised hopes among some British officials that the process would stretch out over several months and that America would revert to a policy of containment rather than "regime change" through military force. But Saddam's refusal to admit that he has any weapons of mass destruction - a claim rejected as a lie by Britain and America - and his recent menaces to Kuwait suggest he is in defiant mood and is set for an early collision with the United States. A senior Whitehall source said the Prime Minister still hoped to avoid a war. "Tony Blair has fought hard to go down the UN route and wants it pursued as vigorously as possible. If there is any chance of avoiding a war he will make every effort to seize it." Britain has described its policy towards Iraq as a "paradox": the best way to prevent a war is to present a "credible" threat of force. But its own tactics now appear to be undermined by Mr Blair's reluctance to commit forces to the region in preparation for a possible war should Saddam be judged to be in "material breach" of UN resolution 1441. Vegetarians?!?!?!? I've had it with you people!!! We're going to keep this party at the Grill House whether you like it or not, so you can sit quietly at the table furthest from the "grill of death," as you so quaintly put it, and you'll get your #$%^&*! salad bar, including organic tomatoes. But you know, tomatoes have feelings, too. They scream when you slice them. I've heard them scream. I'm hearing them scream right NOW! I hope you all have a rotten holiday! Drive drunk and die, you hear me!?!?!?!?!?!?!!!!! NSI Ltd, which runs both Police Reunited and MoD Reunited have been approached by the film industry to assist in finding 300 extras with police or military backgrounds for the production ‘Ultimate Force’. This is being filmed from January 7th 2003 over a period of about 4 months. The location for the filming is the London area. Mad Dog Casting – one of the largest casting agencies in the UK, it represents hundreds of Supporting Artists (SA’s). Mad Dog have supplied SA’s for many major feature films (including Die Another Day), television productions and commercials. Mad Dog have agreed to act as your agent and will take bookings and contact you if / when you are needed. e-media-c is a substantial plc company. They are supported by the Government (Trade Partners). e-media-c’s role is to promote you to people who book SA’s. This is done via one of the most sophisticated websites in the industry which has led to e-media-c being the market leader in their field, used by major clients such as Marks and Spencer, Boden catalogue, Great Universal Stores, as well as Sky Movies, Channel 4, Discovery Channel and some of the biggest advertising agencies in the UK. Those that wish to participate need to be registered with e-media-c. A discounted rate of £35 per year (normally £85) has been agreed. There is no guarantee of a place on Ultimate Force, or indeed any other production, but Mad Dog Casting will act as your agent and e-media-c will promote you to all the key casting agencies in the UK, not just for this film, but throughout the year. Payment for S.A. work starts at about £73 per day. For Ultimate Force specifically, they are mainly looking for males who look 20 to 35 years old. Obviously, for other productions this will vary. NB. To apply in time for consideration for the Ultimate Force production, applications will need to be processed, and your photographs received by e-media-c by Wednesday 18th December 2002 at 12 noon. Please don’t forget that next week’s newsletter will be the final issue before the Holiday, and so I request that you send your seasonal greetings for inclusion to me by the deadline of 2359 Hrs GMT on 19th December. I was thinking that with over 200 members out there what a wonderful Old Boys Briefs it would be if everyone said “Merry Christmas and a Happy New Year” or words to that effect. Talking of things seasonal… did you ever give any thought to poor old Santa eating just biscuits and drinking milk on his round the world trip on Christmas Eve? Apparently that’s not quite true – just like the rest of us he enjoys a wee libation or two.